Hadrian’s Wall crosses England at its narrowest east-west point from the North Sea to the Irish Sea. It is a microcosm of England. It contains two great regional cities – Newcastle / Gateshead in the east and Carlisle in the west. The Newcastle-Gateshead quayside is a focus of cultural activities and art with the Sage Gateshead and the Baltic Art Gallery. With its abundance of good pubs, restaurants and magnificent Georgian architecture it is well worth a visit. To the east is the thriving Port of Tyne. Carlisle is a smaller but influential city supporting a rural area. Its centre is attractive and with a fascinating history is a delight to visit. 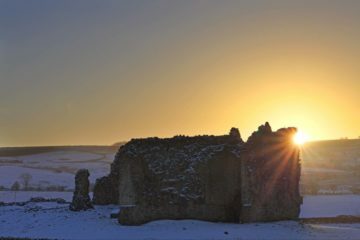 Both cities are on the course of Hadrian’s Wall and are included in the Hadrian’s Wall National Trail. The two coastlines are poles apart in character. The River Tyne enters the North Sea at the towns of Tynemouth and South Shields and has much shipping in and out of the Port of Tyne. The immediate coast line is rocky with cliffs and sandy bays. To the west the Solway Firth is a large expanse of marshes and mud flats – it has its own wild beauty and is transformed by the rise and fall of the tides. It is principally an area of small hamlets and villages. The journey along the course of the Wall from Newcastle and Carlisle is farmland. Leaving Newcastle, Hadrian’s Wall diverges from the rural River Tyne and begins a gentle climb through attractive farmland. 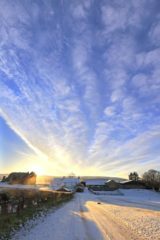 To the south the views are of towering skies, hills and eventually the moors of the North Pennines. The first high point is at Milecastle 24 from which there is a steep decline into North Tynedale. From the River North Tyne at Chollerford Hadrian’s Wall passes the Roman fort of Chesters and rises to Limestone Corner where, to the north, is a panoramic view of the lower section of North Tynedale. After a level stretch of the Roman Wall, including the Mithraic Temple at Brocolitia, the course of the Wall meets the first of the crags of the Whinsill Fault at Sewingshields. This geological phenomenon creates the north facing crags (cliffs) that define Hadrian’s Wall to many. In this higher section just livestock is farmed typical of the uplands. This terrain continues with its twists, turns and undulations to Walltown Crags where the Wall drops to the lower and flatter landscape of Cumbria. The Northern Counties of England and the Scottish Borders have a very long history of violence. Much was because of the power struggles of the different kings and their aspirations of greater power, but, there were three hundred years of carnage and mayhem of family against family, bands of Rievers and private armies. This resulted in a plethora of fortified buildings from castles and forts to fortified manor houses and farm houses, bastles and pele towers. 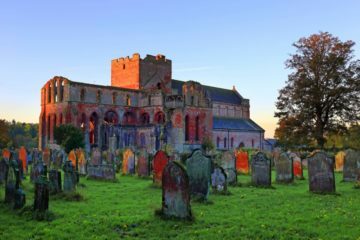 Lanercost Priory is a magnificent building, partly ruined, partly an active site of worship. The picture was taken early on a bright autumn morning. The early red light of the sun emphasizing the local red sandstone. To the north of Hadrian's Wall in Cumbria is Bewcastle. It was a Roman outpost, later adopted by the Normans and later again by the Armstrong Border Rievers. 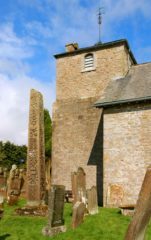 Bewcastle, a few miles north of the Hadrian's Wall Trail in Cumbria, is the small Church with its well preserved runic cross. Bewcastle was a Roman picket fort north of Hadrian's Wall in Cumbria. It was later adopted by the Armstrong riever family as a fortified stronghold in violent times. 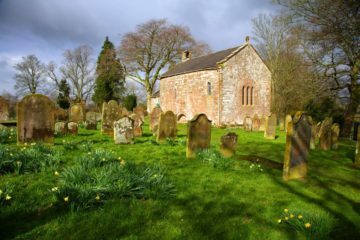 Brampton in Cumbria is a few miles south of the Hadrian's Wall Trail. 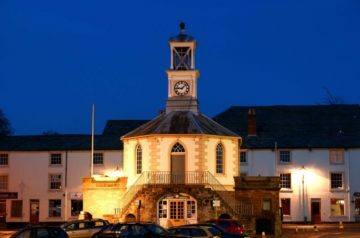 It is a very attractive small town with an octagonal Moot Hall built in 1817. 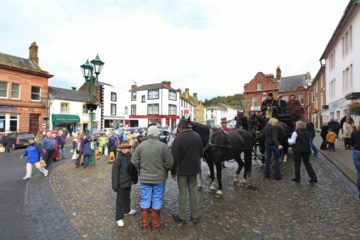 A quick stop in Brampton during the Charity Stage Coach run along the route of Hadrian's Wall. 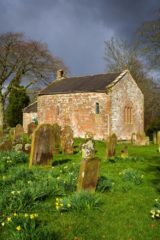 The picturesque Old Church at Brampton in Cumbria is west of the town and 1.5 miles south of the Hadrian's Wall Trail. 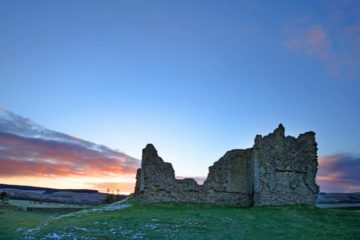 It was built in the 12th century on the site of a Roman Fort. 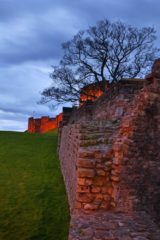 Carlisle Castle's early ramparts were probably built from stone from the nearby ruins of Hadrian's Wall. The picture shows the earliest section. There is a museum in Carlisle Castle. Carlisle Castle in Cumbria is a magnificent building and a remnant of the days when Carlisle was a frontier town in violent and lawless times. It is well worth a visit. 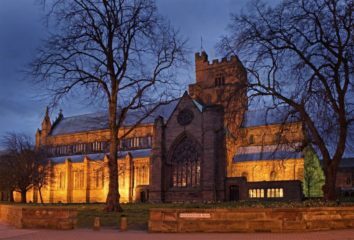 Carlisle Cathedral in Carlisle, Cumbria is on the route of the Hadrian's Wall Path. 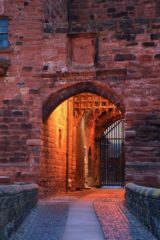 Good places to visit include Tullie House Museum, Carlisle Cathedral and Carlisle Castle.